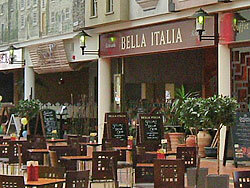 Conveniently located in the Red Dragon Centre in Cardiff Bay, Bella Italia makes for an ideal venue for a pre-cinema meal. Bella Italia is a UK-wide chain of Italian restaurants, so you know what to expect, good Italian food at reasonable prices. Students can get 20% off their food bill upon production of a valid NUS or UCAS card on selected weekdays.